Hi, I'd like to show you this page I found on Gallery Furniture's website. *All prices are web exclusive. This listing must be mentioned in store at the time of purchase in order to receive discount. This rectangular table and chair set blends traditional and cottage design elements, making it a charming addition to any dining space. The two-tone table includes a drop-in leaf to accommodate more people when needed, and the ribbon back side chairs offer a stylish and comfortable place to dine. 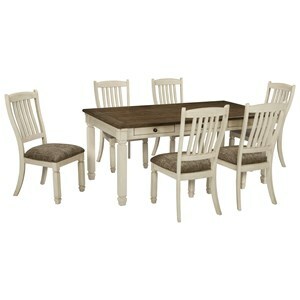 The Realyn 9 Piece Rectangular Table and Chair Set by Signature Design by Ashley at Gallery Furniture in the Oregon, Portland, Clackamas, Washington, Beaverton, Northwest, Vancouver area. Product availability may vary. Contact us for the most current availability on this product. Case Detail Framed drawer fronts and overlay decorative corbels dress the cases nicely. Two-tone finishes and ornate detailing come together to create this traditional, cottage-style collection that will fill your home with charm. Featuring plenty of storage options and durable construction that you can rely on, this collection will serve you well for years to come. The Realyn collection is a great option if you are looking for Traditional Cottage furniture in the Oregon, Portland, Clackamas, Washington, Beaverton, Northwest, Vancouver area. Browse other items in the Realyn collection from Gallery Furniture in the Oregon, Portland, Clackamas, Washington, Beaverton, Northwest, Vancouver area. Gallery Furniture features a great selection of living room, bedroom, dining room, home office, entertainment, accent, furniture, and mattresses, and can help you with your home design and decorating. View recent additions to our online furniture gallery. 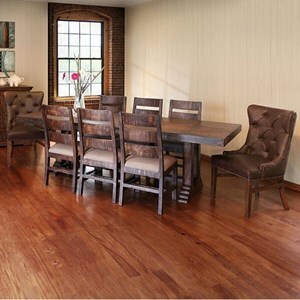 Gallery Furniture offers great quality furniture, at a low price to the Albany, Aloha, Astoria, Aurora, Battle Ground, Beaverton, Bend, Camas, Canby, Cannon Beach, Corvallis, Dallas, Eugene, Forest Grove, Gladstone, Gresham, Hillsboro, Hood River, Keizer, Kelso, La Center, Lake Oswego, Lebanon, Lincoln City, Longview, McMinnville, Newberg, Newport, North Plains, Oregon City, Portland, Redmond, Salem, Scappoose, Seaside, Sherwood, St. Helens, The Dalles, Tigard, Tillamook, Tualatin, Vancouver, Vernonia, West Linn, Wilsonville, Woodburn area.